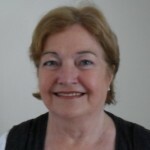 Mairead Maguire is a peace activist from Northern Ireland. She co-founded, with Betty Williams and Ciaran McKeown, the Women for Peace, which later became the Community for Peace People, an organisation dedicated to encouraging a peaceful resolution of the Troubles in Northern Ireland. Maguire and Williams were awarded the 1976 Nobel Peace Prize. Maguire has also won several other awards.